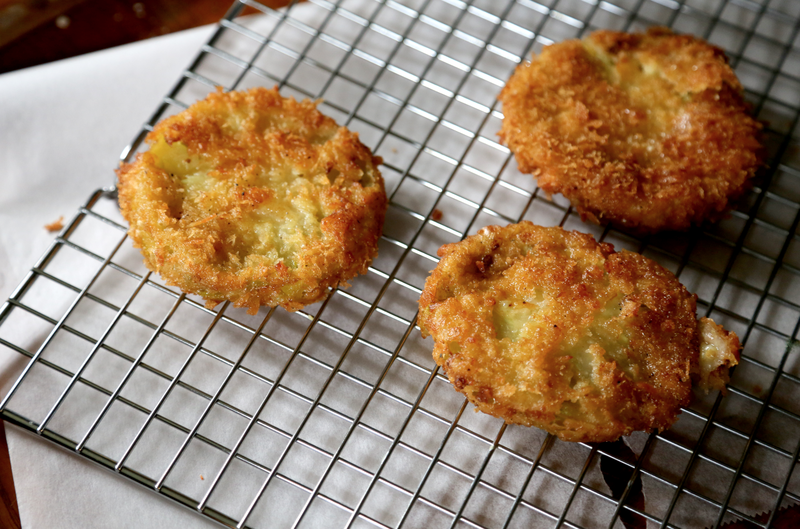 lemonade lists: Fried green tomato & shrimp sliders. Time to throw in the towel because this is as good as it gets. 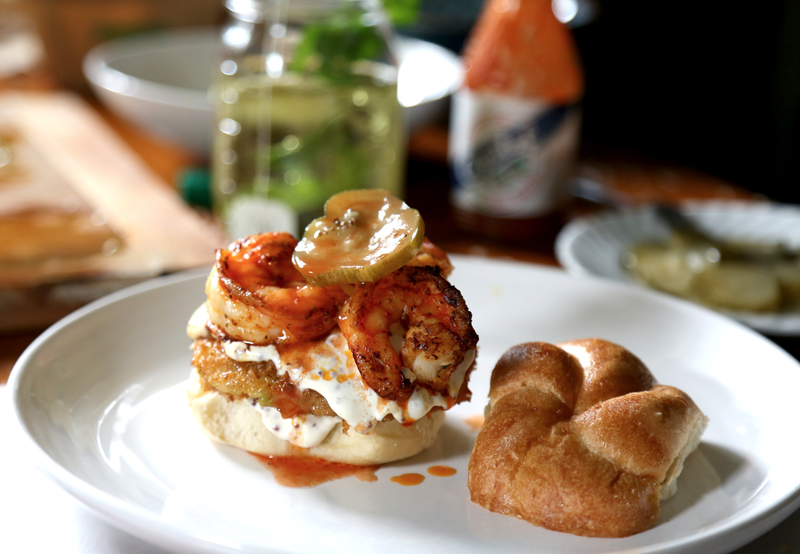 Fried green tomato & shrimp sliders. Time to throw in the towel because this is as good as it gets. Seriously, this may be the best thing I've ever cooked, as in I might as well pack up and never cook again because it's not going to get better than this slider. Hot fried green tomatoes, spicy seared shrimp, sweet bread & butter pickles, tangy remoulade, and vinegar-y Crystal hot sauce on buttery mini Kaiser rolls. The Dale City Farmers Market was a complete cluster this morning. I've never seen it that busy in all my years in the area. Apparently eleven in the morning is the golden hour of the farmers market. There was a Celtic violinist playing classical and contemporary music next to the big peach stand. She started playing “Let It Go” from Frozen and a lady with two young children rushed past me saying, “Oh dear lord, I need to get out of here before these two start singing.” I laughed so hard I knocked over a pile of peaches. The older gentleman from whom I bought the green/heirloom tomatoes asked what I was going to do with them. I told him I was going to fry them up. He said he missed fried green tomatoes, that his mother used to make them, and that he hadn't had any in such a long time because his wife didn't like fried green tomatoes. I could have stayed there and talked to him for ages—he probably would have been just fine with that—but the lady standing behind me looked harried and grumpy. What kind of crazy lady gets grumpy at eleven in the morning holding a pint of baby eggplant, I'll never know. me: I'm at the farmers market. 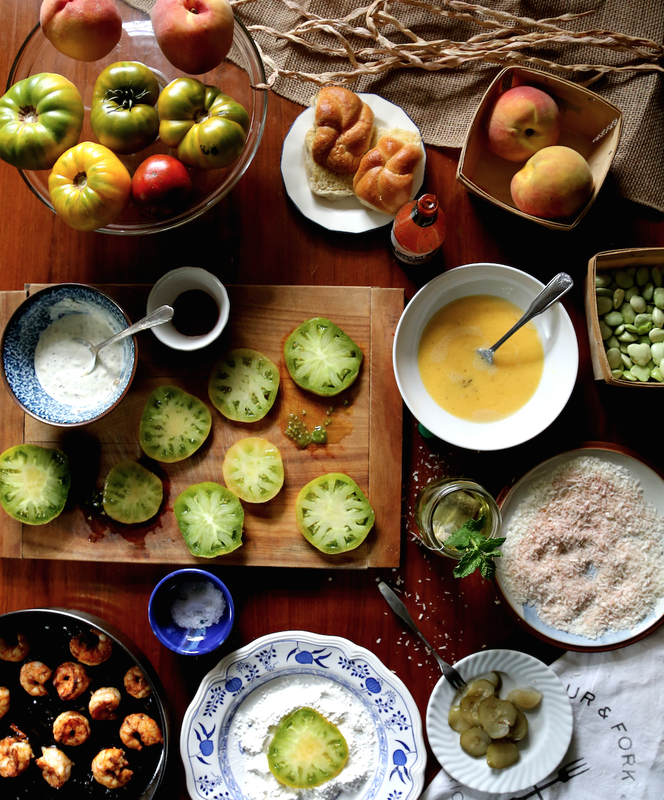 I'm going to make fried green tomato and shrimp sliders. Justin: That sounds very southern. me: I love me some southern food, y'all. me: AND I'm wearing my big sun hat. Damn. Just, damn. I'm going to marry myself and cook this on my wedding night. 1. Heat about an inch of vegetable oil in cast iron skillet over medium heat. 2. Blot tomato slices with paper towel. Season with salt and pepper. Dredge in flour, or Korean frying mix (which is basically flour + cornstarch) and shake off excess flour. Dip in egg mixture and then roll in panko bread crumbs with paprika. 3. Fry in batches, about two-three minutes each side, until brown and crispy. 4. Let drain/dry on wire rack until all tomatoes are fried. 1/2 cup of mayonnaise. I use Duke's, it's the best. 1 Tbsp. pickle juice - I used bread & butter pickle juice, but I imagine a spicy dill pickle juice would also be tasty. 1 Tbsp hot sauce. I used Crystal hot sauce. Tabasco would be good. Combine all ingredients in a bowl and set aside for flavors to come together, like a Beatles' song. Cover with plastic wrap and chill in fridge until needed. 1/2 lb of large shrimp. Mine were South Carolina shrimp. I don't really have a preference of shrimp origin, that's just where they were from. 1. Peel & devein shrimp and place in bowl. Add other ingredients and use hands to mix until shrimp are well seasoned. 2. Heat a stove-top grill pan over medium heat. Grease with oil or butter. Once hot, sear shrimp on each side until just cooked. Try not to overcook the shrimp. They're like eggs, they'll cook a little bit more once you remove them from the heat, so it's ok if they're slightly translucent when you take them off the heat. Set aside until slider time. To assemble, starting from bottom: Bun. Remoulade sauce. Fried green tomato. Shrimp. Pickle. Lettuce. More remoulade. Finish with hot sauce and top bun. 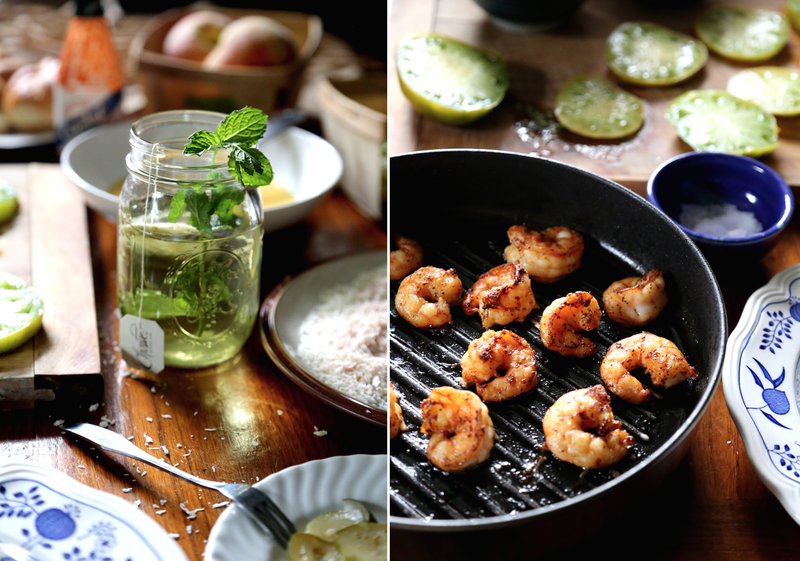 Enjoy with mint tea, cider, or a cold beer. Weep a little bit because it's so delicious. Text everyone in the inner circle proclaiming that you'll never cook again because it's never going to be as good as this. buttermilk pie and pimento for all! but right now I like it this way, kind of quiet.